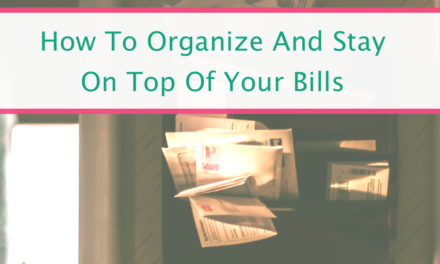 Keeping an organized home doesn’t mean you have to spend a lot of money. 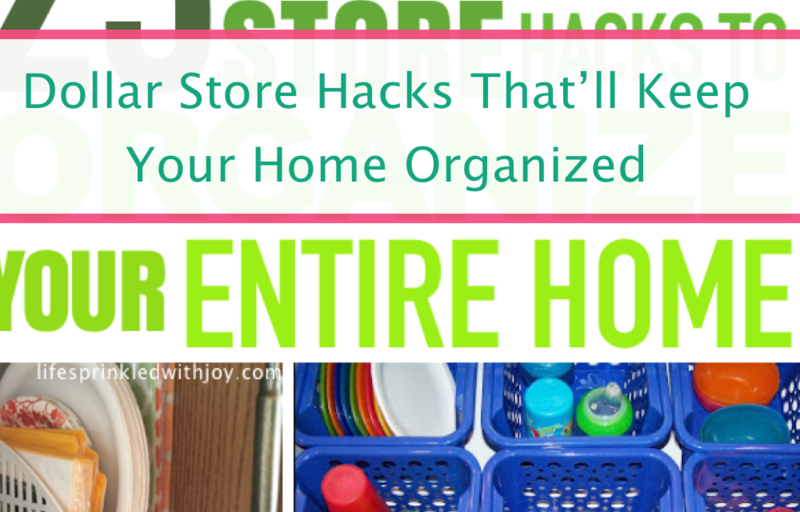 In fact, you can organize your ENTIRE HOME with just one trip to the dollar store. 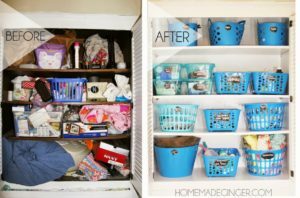 Check out these awesome ideas for keeping all the trouble areas in your home need and tidy—all cheap and inexpensive because they’re ALL dollar store finds! I hate putting away cutting boards and baking sheets, they can be so hard to organize! 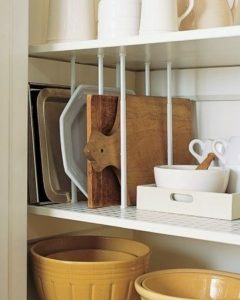 Tension rods make the job easy, and using them in your cabinets will save you so much space! 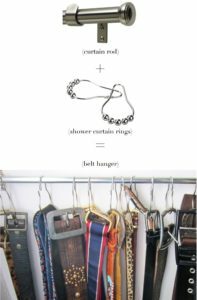 This is a GENIUS way to hang up belts and keep them from falling all over the floor! You don’t need much to complete this project, and you can get most of what you need at the dollar store! How cool is this? Using a cooling rack to hang jewelry is so unique, and the styling done by Smile and Wave is proof that you can make it look amazing too! 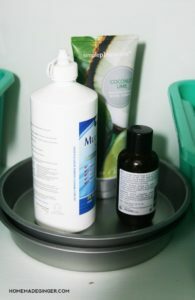 This easy lazy susan organizer is just two cake pans and some marbles—imagine how much space you can save with one (or two) of these in your kitchen cabinets or in the bathroom! When there’s a mess in the refrigerator it’s just the worst. 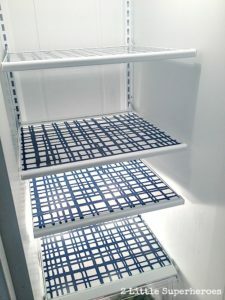 Save yourself from having to clean up those messes by using dollar store placemats to line your shelves! Genius! When you have kids you ten to have crayons and colored pencils everywhere. 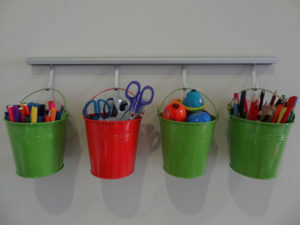 Give them a place to put their art supplies using dollar store plastic buckets! 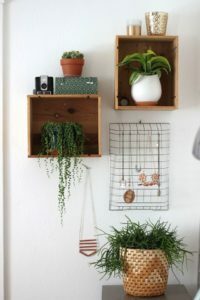 I love the idea of hanging them up on the wall too—makes everything so accessible AND easy to put away. 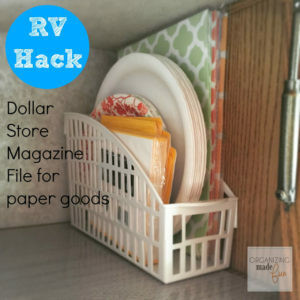 Keep paper plates, napkins, even tablecloths in one organized space using a dollar store magazine file. 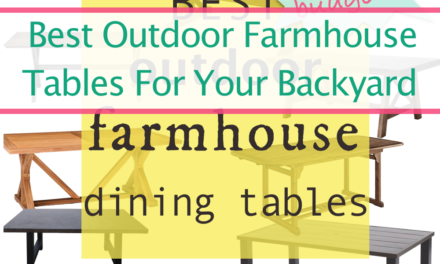 This idea is great for traveling or even picnicking too—just grab and go! 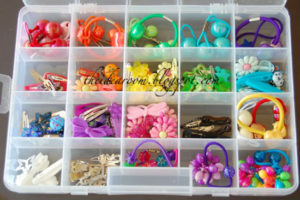 Keep your kids hair accessories sorted and organized by giving them a place! Store hair ties and barrettes using a dollar store craft organizer. Get rid of unsightly cords by using hooks and dollar store bins to hang and hide your chargers. 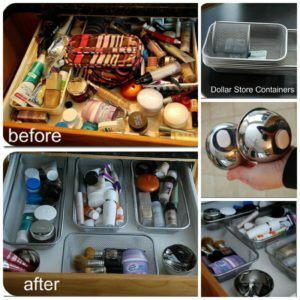 Sippy cups and lids and snack container—these can end up all disorganized and scattered in your drawers. 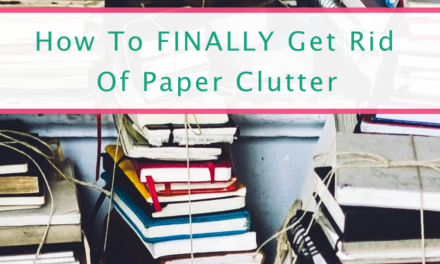 Bring order to the chaos and use bins to separate and organize! Leggings all over the place? 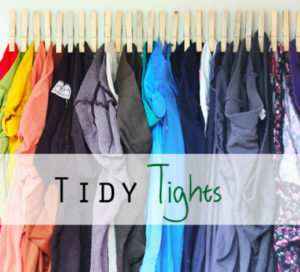 Never again—just use clothespins to hang them all up easily! Mugs are great, but I tend to somehow obtain way more mugs than I need. The solution? Well, of course get rid of some, but also find another way to store them. 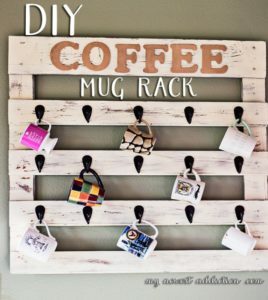 This DIY coffee mug rack is great—it keeps the space organized AND it can done super cheaply too! 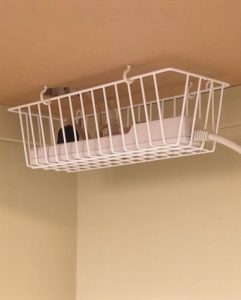 Just get some dollar store hooks and there you go. 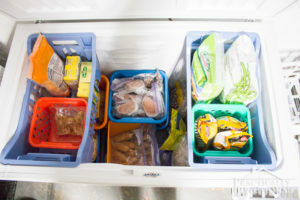 We have a separate freezer in the basement, and it is so disorganized! Getting dollar store bins like these can help you maintain the chaos much more efficiently. 14. And Do The Same For Your Fridge! Of course, why stop with just the freezer? 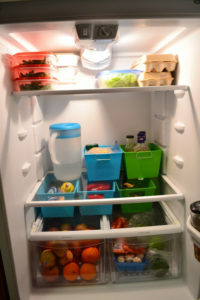 Organize your fridge using bins, and trust me you’ll never go back. 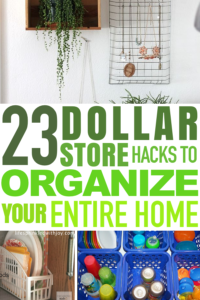 Yep, the dollar store can even tame your closets. Make your own tags for each bin so you know what goes where. 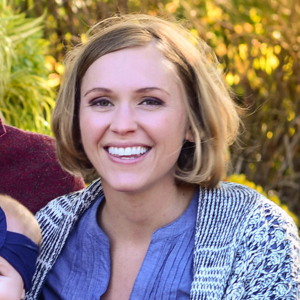 If your family is anything like my family, chances are you can never have too many first aid kits lying around. 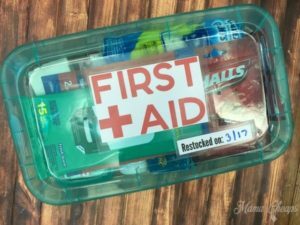 Organize your bandaids and necessities using dollar store containers. Make one for each floor in the house and for the car too! Tupperware—and tupperware lids—can make or break my day. If I open the cabinet door and immediately find myself showered with mismatched lids, it’s all over. 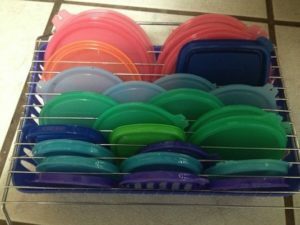 Never again—this clever hack using a dollar store cooling rack to keep all those crazy lids in check. Shoes can clutter up a home quickly. 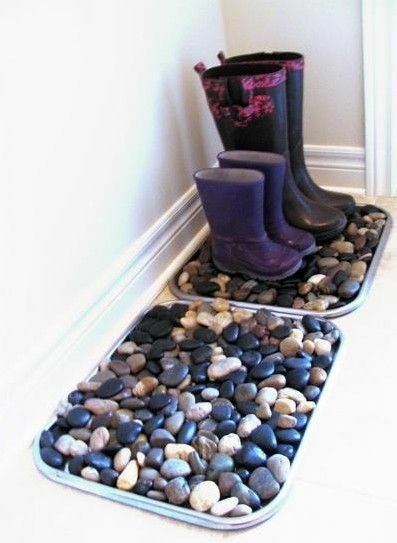 Find a space to put shoes, and make it fun too! This DIY craft is so easy, all you need are dollar store decorative stones and rimmed mats! Under the kitchen sink can be one of those messes you go out of your way to avoid. 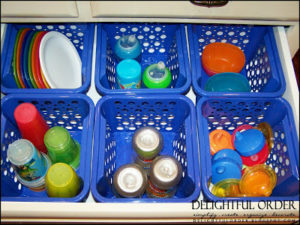 With dollar store organizing caddies and bins you can make under the kitchen sink the tidiest place in the house! 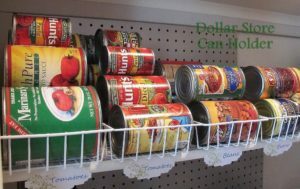 Canned goods can get all over the place, so why not use dollar store can holders to keep them organized and in their place? Spices can be organized too, and they don’t have to take up a ton of space. 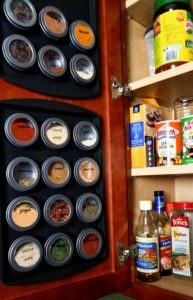 This idea is so simple—using dollar store tins, magnets, and baking sheets to make your spices more accessible and free up some extra cabinet space. 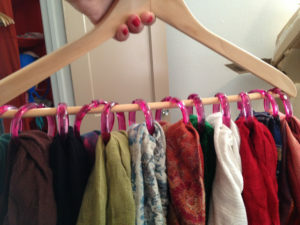 Never let scarves mess up your room again—all you need are some cheap curtain rings from the dollar store and a hanger! 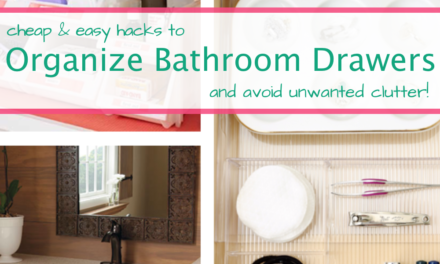 And finally, even the junk drawer can be tamed with dollar store finds! Use cheap desk organizing containers and velcro to bring about some order to this mess. 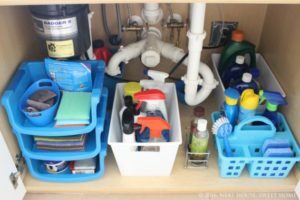 What cheap solutions have you used to organize your home? Let me know I’d love to share it!